... with all modern amenities. Run by Richard and Lynwen Orchard who are third generation hoteliers. Located in a quiet street in Bloomsbury, just minutes from the British Museum, Covent Garden and the West End. Our family run hotel offers you welcoming bed and breakfast accommodation. There are 16 comfortable ensuite bedrooms with many original fireplaces and features. Our delicious full English or continental breakfast will set you up for a full days exploring Central London. We are always on hand to help with directions, organise tours and other London information. 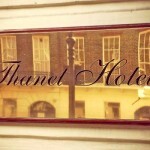 The Thanet Hotel is a great little place to stay. We hope you will feel it is your home away from home; indeed, most of our guests have stayed with us several times before or come to stay through personal recommendation.